You'll love this Sturbridge Patch Black Standard Sham, part of the Sturbridge Patch Black bedding collection. The designs coordinate with the Sturbridge Black collection found on our website. 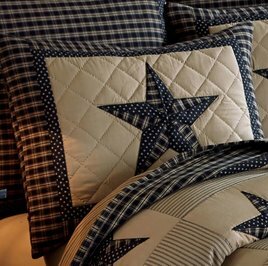 Sturbridge Patch Black King Sham has a large star on a khaki field with diamond shaped quilting and a black plaid border. Quality quilted construction. The designs coordinate with the Sturbridge Black collection found on our website. The pattern of this quilted Sturbridge Patch Black Patchwork Euro Sham mimics the design of the quilt perfectly. 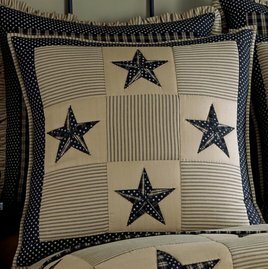 An alternating block pattern of tan/black ticking and tan with a black patchwork star complete the center of this large sham. 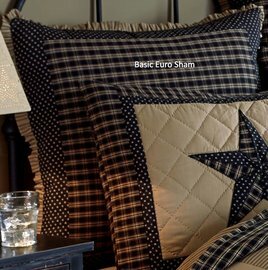 You'll love these Sturbridge Patch Black Basic Euro Sham from the Sturbridge Patch Black bedding collection. The designs coordinate with the Sturbridge Black collection found on our website.